The Błędów Desert (Pustynia Błędowska in Polish), one of the most mysterious and unique areas in Poland, located just 50 kilometres away from the capital of Małopolska, is about to be stripped of its vegetation as part of a programme leading to its revitalisation. The programme aims to transform the desert into one of the most important tourist attractions of the region. Works on the project are to begin in September thanks to an initiative from activists in the Polish Sahara Association and local authorities. Concerns about the problems the region faces and the need for its protection have been heard for some time, but the main obstacle was the lack of money. But now, thanks to European Union funds, the realisation of these goals is feasible. The desert, filled with undulating dunes and covering approximately 33 square kilometres, is the biggest region of its kind not only in Poland, but also in Europe. The region was described in the 1930s as an “extensive emptiness, eerie wilderness, sea of sand, piece of bare ground,” that was “breathing with lifelessness” by Marian Kantor-Mirski. The desert arose not from specific climate conditions, but was borne of human activity. Until medieval times the entire area was covered in forests, which grew over vast spaces of thick layers of sand, deposited by waters flowing out of melting glaciers. The situation changed in the 12th century, when residents cleared local forests to satisfy the needs of silver and lead foundries from nearby Olkusz. As a result, sands, devoid of flora, covered the surface and formed dunes, which resulted in an inimitable natural form. This is a place where sandstorms occur and even the phenomenon of the mirage has been experienced. A mirage, of the fata morgana type, was described in 1924 by the botanist Kazimierz Piech who noted a recollection of a tourist, who saw the illusion of a lake when taking a walk through the desert. Beginning from the early years of the 20th century, the desert was used as a military training ground by Polish troops, and later by a German contingent, which, under the leadership of General Rommel, prepared for military actions in Africa. At present, only the northern part of the desert serves as a training ground and it is mainly used for parachute jumps. The area has the character both of a sanctuary and a natural landscape park inhabited by rare animals, where one can also find several species of protected plants. 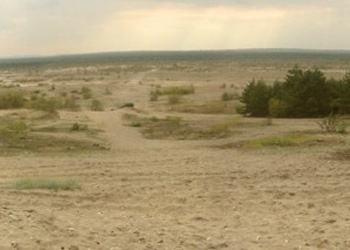 However, due to various factors, the Błędów Desert has lost many of its natural resources. Vegetation has crept into the desert, in many places occupying an increasing amount of space. While some natural factors are responsible for this, it is also human activity that shares the blame. For years the desert has been the casualty of detrimental human actions made by corporations (sand exploitation), foresters and troops (due to brutal interference in the 1850s, when part of the area was ploughed and planted with trees to meet the needs of the army). Amateur motor racing, a fashionable form of exploring the region, has added to its poor condition. In consequence, its present scenery is less and less that of a desert, and rather more of a steppe. The solution to all of these problems is European Union programmes and activities aimed at recovering the primordial character of the desert and its unique ecosystem. “Within 10 to 15 years we are planning to remove non-desert vegetation from about 70 percent of the area, or 250 hectares… and to exhibit the biggest inland dunes in Europe situated there,” Marian Pajdak, the chairman of the Polish Sahara Association, told Gazeta Wyborcza, adding that the whole process will have to be carried out gradually to prevent an ecological catastrophe. For safety reasons, it is also essential to clear mines from the region occupied by a military training ground. It is hoped that such activities will lead to an economic revival of the region, attracting visitors who are presently disillusioned with the way it looks. The Polish Sahara Association has various ideas on how to utilise the territory; above all they are pushing for the creation of dune observation sites and didactic paths showing natural peculiarities. Since the better-preserved part of the desert belongs to the Military Property Agency, in order for the enterprise to be successful it is crucial to receive consent for its utilisation from the army. The Ministry of National Defence will express its final decision on the issue after making internal settlements and discussing the details. It is hoped that thanks to such actions the desert will permanently come into the canon of unique natural attractions in the Małopolska region and perhaps even one day it will be possible for all interested visitors to experience the phenomenon of fata morgana.